Russell Optics is a custom manufacturer of Precision Optics. We manufacture extremely High Precision Optics to the world from our facility in West Rutland, Vermont. We are a small shop able to manufacture optics to your specifications from beginning quote, to completed job with an excellent turn around time. We stock various types of optical glass and are often able to start work on the customers job the very day we receive the purchase order. Our specialty is Super Flat Optics. Consider us your one-stop shop for High Precision, Quality Plano Optics and Optical Flats. 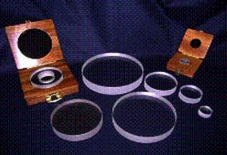 We manufacture and stock a line of Optical Flats ranging from 1 ” to 12 ” in diameter. Many sizes IN STOCK, ready to ship!